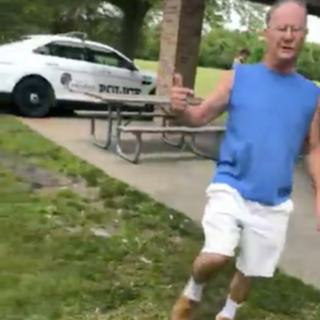 A woman wearing a Puerto Rican flag shirt at an Illinois park was racially harangued by a white man as a police officer stood by. Mia Irizarry, 24, filmed the stranger’s tirade, which unfolded as she set up a picnic to celebrate her 24th birthday. She repeatedly urges an officer to intervene as the man confronts her, jabbing his finger at her and demanding to know if she is a US citizen. Local officials said the officer has been assigned to desk duty. The Forest Preserves of Cook County, a local government agency that manages parkland in the Chicago suburbs, said it was investigating the officer’s actions. Authorities said the intoxicated suspect was arrested and charged with assault and disorderly conduct over the 14 June incident. He was named in police reports as 62-year-old Timothy Trybus. In the video clip, as Mia Irizarry sets up her picnic the man approaches and demands to know why she is wearing her shirt, which had “Puerto Rico” written on it. “You should not be wearing that in the United States of America,” the man shouts. We are aware of the the June 14 incident and video. After the incident, we immediately launched an investigation pursuant to our personnel policies into the response of our officer. Ms Irizarry tells him Puerto Rico is part of the US, politely addressing the man as “sir”. But the policeman does nothing. But the officer walks away. “OK, OK,” Ms Irizarry says, trying to placate him. Pointing at her, the man says: “You’re not American, if you were American you wouldn’t wear that. As more police officers arrived, the man was detained. Ricardo Rossello, the governor of Puerto Rico, has tweeted about the Facebook video, which has garnered 1.3m views. Cook County Board Chairman Toni Preckwinkle said she had spoken to Governor Rossello about the incident. She said the officer’s “completely unacceptable” actions do not reflect Cook County’s values. Illinois Congressman Luis Gutierrez released a statement on Tuesday afternoon urging the Department of Justice to investigate. State Senator Iris Martinez called for the officer to be fired. Puerto Rico is a US territory whose residents have been American citizens since 1917.